The second edition of the 2001 book, Wilmington Through the Lens of Louis T. Moore, is being posted here, chapter by chapter. Mr. Moore’s panoramic photographs of Wilmington, North Carolina and surrounding areas document history; preserve what is lost in terms of people, architecture, and landscapes; and create a mood. Just as his camera was considered hi-tech during the 1920s in Wilmington, we think Louis T. Moore would smile if he knew his work was appearing in cyberspace. 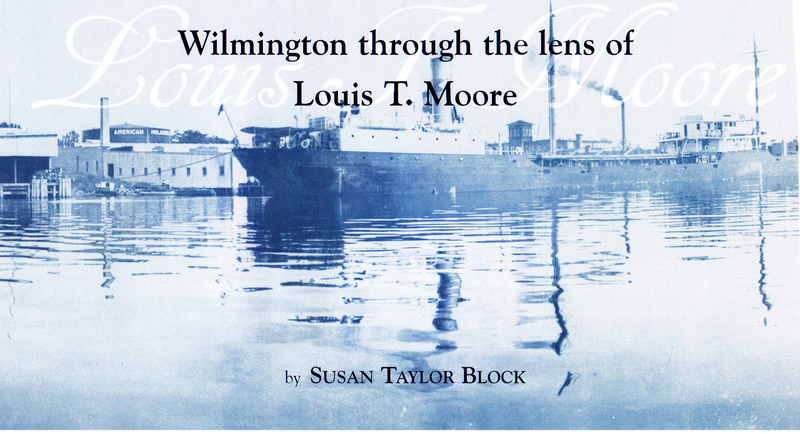 Wilmington Through the Lens of Louis T. Moore was written by Susan Taylor Block, and published by the Historical Society of the Lower Cape Fear and New Hanover County Public Library. Mr. Moore was a founding and enthusiastic member of the historical society and his photographs are housed in the public library, one of his favorite places. Copies of the bound edition are available through the Historical Society of the Lower Cape Fear (910-762-0492). The 2001 edition was edited by Suzanne Nash Ruffin and designed by Jane L. Baldridge. The second edition is being edited by the author to reflect new discoveries and identifications. Wilmington Through the Lens of Louis T. Moore is dedicated to the late Florence Hill Moore Dunn, Margaret Yeamans Moore Perdew, and the late Ann Kidder Moore Bacon, beloved daughters of Louis Toomer Moore and Florence Kidder Moore.